Today's khutba was given by Tom Facchinne (Sheikh Facchinne) was born into an Italian American family and accepted Islam in 2010. In 2011, he graduated from Vassar College with B.A in Political Theory and International Relations. 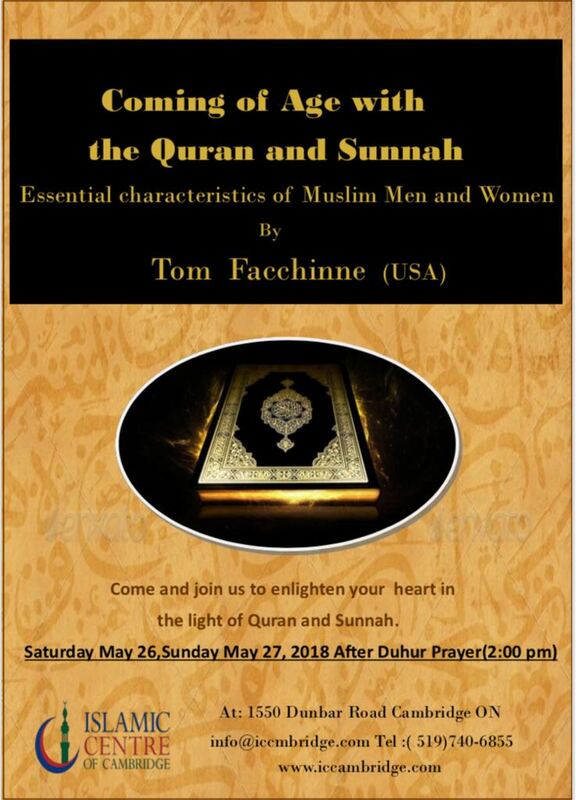 Sheikh Facchinne began his studies in Madina in 2015 and is continuing as a student in the faculty of Islamic Law at the Islamic University of Madina. 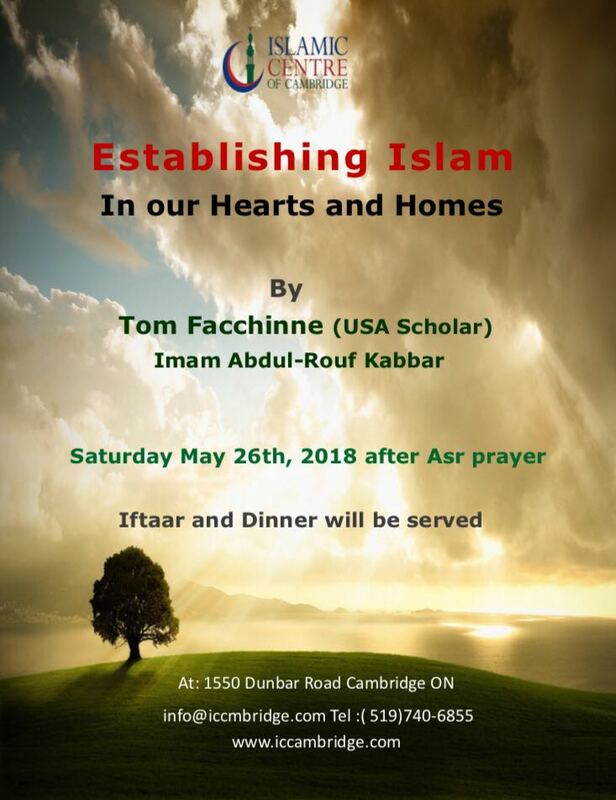 The ICC is organizing today it's "Annual Ramadan Celebration | Iftaar Dinner with Non-Muslim Community"
Tickets are available in the office for $20 per person and Sheikh Facchinne will be the special guest speaker. Topic: "The Promise of Diversity & Pluralistic Society" so please come with family and friends to join us. Topic: "Establishing Islam in Our Hearts and Homes"
Please note that "Annual Fundraising Dinner" is scheduled for Sunday 03-June, 2018 at ICC. We are privileged to have Dr. Munir El Kassem as our guest speaker so the event is free for everyone, please bring along your friends and family. There will be Daily Iftaar & Dinner served during the month of Ramadan so please contact the office, if you like to book a day for providing Iftaar & Dinner to the Masjid. We are pleased to announce that ISOC is organizing an exciting Summer Camp for Children. Last few days are left for an Early Bird Discounts for New Registration at the International School of Cambridge, ISOC continues until Thursday 31-May, 2018. JK students will receive a 25% Discount in the school fee for the first 3 months of the school year (September to November 2018). Topic: "Becoming an Ambassador of Islam in West"
Topic: "The Promise of Diversity & Pluralistic Society"
Last few days left for an Early Bird Discounts for New Registration at the International School of Cambridge, ISOC continues until Thursday 31-May, 2018. 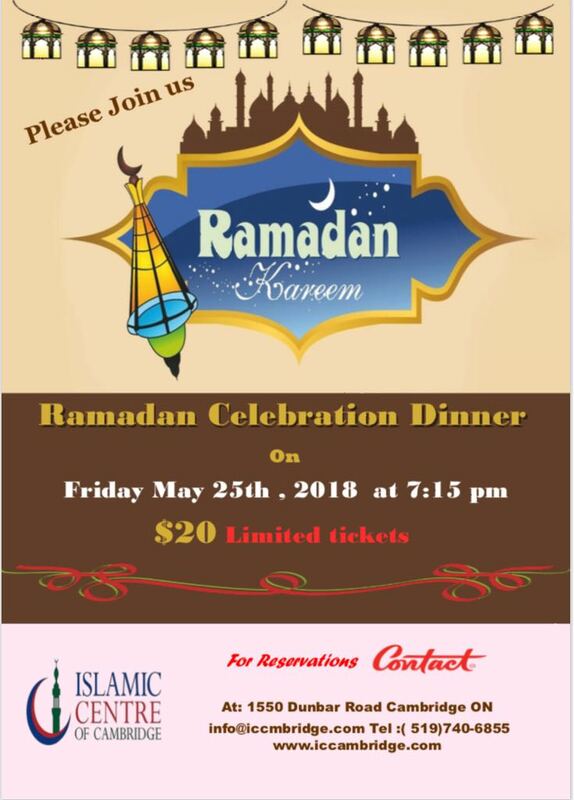 Please mark your calendar for "Annual Ramadan Celebration" event at ICC on Friday 25-May, 2018 and this will be an Iftaar Dinner with the Non-Muslim Community. Early Bird Discounts for New Registration at the International School of Cambridge, ISOC continues until Thursday 31-May, 2018. Sunday 06-May, 2018: Enlighten yourselves by joining us on sisters event of Pre-Ramadan Milad Celebration with zikr, nasheeds & lecture by Ustadha Asifa Ausaf in Islamic Centre of Cambridge and the light refreshments will be served.